The webzine keeps getting better and better! 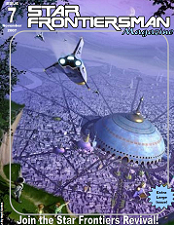 In this issue, we have some great conversions of the Alternity races and genre, as well as some excellent suggestions on how to referee the Star Frontiers game. Cover art by Mark Garlick. - Oh come on, you know you like these!